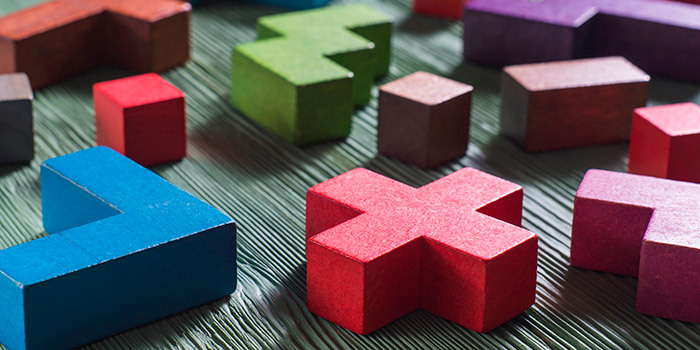 Supplementing asset-class diversification with strategy diversification increases the potential for portfolio risk management and can improve risk-adjusted returns. 1. Because traditional diversification reduces risk by using assets with low correlation, a portion of the portfolio will always be underperforming during rising markets, dragging down overall performance. 2. In declining markets, correlation between assets classes tends to increase, eliminating the value of diversification as a form of risk management. 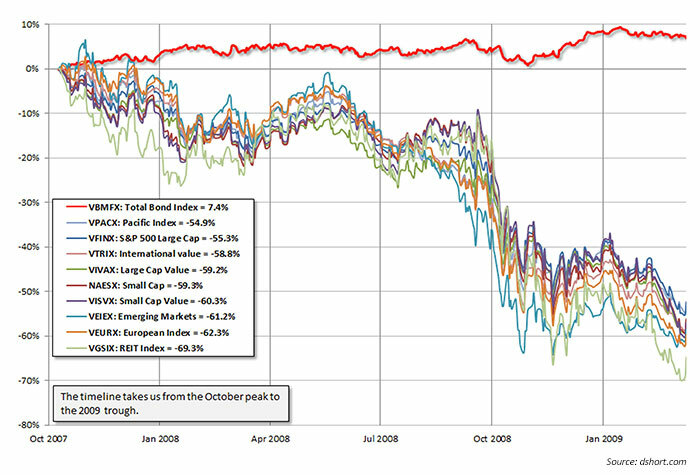 The bear market of 2007–2009 saw many assets classes decline, with Treasurys, gold, and cash being notable exceptions. High-yield bonds and real estate plummeted along with the S&P 500 and international markets (Figure 1). 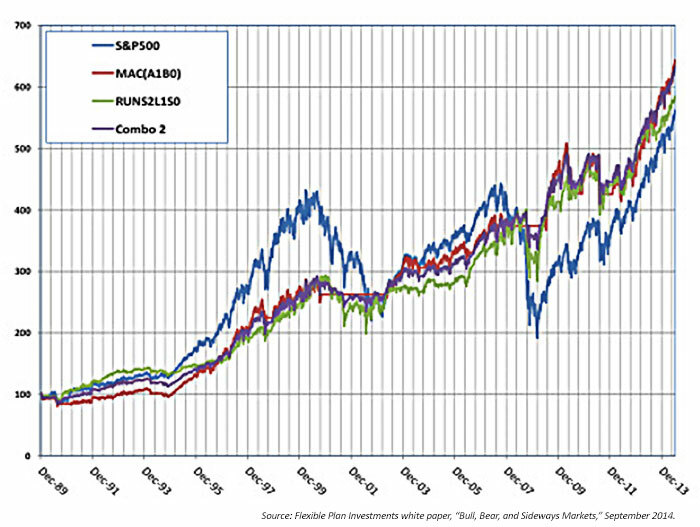 As the accompanying analysis from dshort.com said of the situation during the credit crisis, “Diversification works…until it doesn’t.” Vanguard’s Total Bond Index is the only asset class in this example to gain value over the period of the overall decline, but in a typical diversified portfolio it would not have had sufficient impact to offset the damage incurred in other asset classes. 3. Asset diversification sometimes requires investors to act in direct conflict with what seems to be in their best interest. Periodic rebalancing requires selling profitable positions and investing in asset classes that are losing value. Diversification provides investors with the important ability to invest in the face of uncertainty. 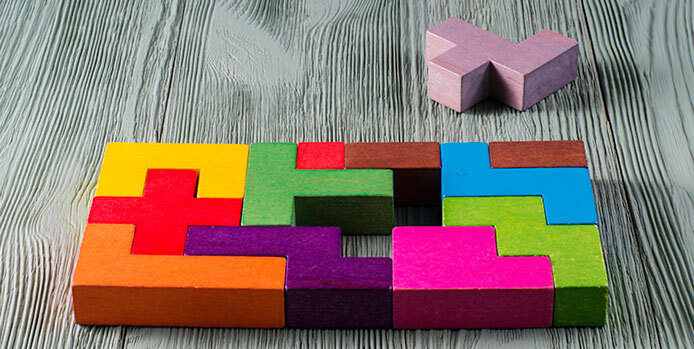 Rather than abandon diversification as a risk-management strategy, it’s time to rethink diversification—supplementing asset-class diversification with strategy diversification. Forward-thinking active-investment managers have already done so. There are as many ways to invest in the financial markets as there are innovative minds to devise and implement their strategies. What is missing is the one strategy to rule them all. Nor is it likely the “one strategy” will ever exist. In part, the very complexity of the financial markets and the interplay of global forces limit the ability of any strategy to succeed across all market environments, volatility, cycles, and evolution. Strategies experience periods of out- and underperformance. The human factor also plays a role in the inability of a strategy to beat the market year in and year out. When a strategy proves profitable, it quickly attracts new competitors using the same methodology, creating a condition known as the “crowded trade.” As more players compete for limited returns, the profitability of the strategy diminishes and returns may turn negative. Investment strategy diversification is a tool to manage the risk of an individual strategy underperforming or failing to meet its objectives, much as asset-class diversification is a tool to manage the risk of an individual investment underperforming. Active investment strategies are designed to capitalize on opportunities in the current market environment and impact portfolio performance. Past performance no longer controls the investment decision. Traditional passive asset allocation is very limited in its ability to affect returns. The market controls the portfolio’s performance. Because historical data determines the asset allocation, there is no ability to adjust a portfolio to current market conditions. Risk management is multidimensional with strategy diversification. Successful strategies minimize losses while maximizing gains within the acceptable risk parameters. A portfolio using 10 different strategies may also be using 10 or more different approaches to risk management. An advisor can more freely choose to diversify among the best-performing strategies most suitable to the current market regime. Selecting strategies based on low correlation is still valuable, but not the sole or most important guiding criteria. With strategy diversification, the advisor has the ability to tap into some of the most innovative and analytical minds in the investment industry. While managers can never guarantee that a strategy will perform as anticipated, market conditions are a critical aspect of the decision matrix. Over the last 20 years, a new investment discipline has been developed for analyzing and selecting investment strategies and managers rather than individual investments. Initially, brokerage firms would issue lists of approved advisors and subadvisors for wrap accounts, leaving the decision of strategy diversification up to the registered representative or investment advisor. See Related Article: Black swans & the ‘10 best days’ myth: Can investors prepare for market outliers? Advisory firms would combine their proprietary strategies in a diversified portfolio. “Manager of managers” firms evolved, evaluating and selecting managers as subadvisors for their investment programs. A select number of early innovators in strategy diversification developed custom portfolios of strategies, with disciplined performance monitoring, quarterly rebalancing, and the removal of old and addition of new strategies as necessary. Strategy #1. A longer-term trend-following strategy based on the classic “golden cross” indicator: Long the SPX when the 50-day simple moving average (SMA) crosses above its 200-day SMA. 100% cash when the reverse happens. Strategy #2. A mean-reversion strategy based on short-term price trends: 100% long position in the SPX at the close of a market day when the SPX has been down two days in a row (including the same day of trading). Cash when the index has been up two days in a row (including the same day of trading). This two-strategy combination not only delivers higher overall returns, but also a much smoother ride for investors, with better risk-adjusted returns and a more favorable drawdown profile during various market regimes. While the two-strategy approach presented here is, of course, only one strategy combination among millions that could be used, it does provide a concrete and illustrative example of the concept. During the period from 1989 to 2014, the two-strategy combination had a smoother long-term equity curve than the SPX and a significantly better profile on a variety of risk considerations. Did it outperform the SPX every period? Of course not. But that is hardly the most important point for advisors and their clients who are seeking controlled and risk-managed growth over the long term. Strategy diversification can provide a framework for working with investment managers through the ebbs and flows of strategy performance. If an investment approach is underperforming in current market conditions, it may return to outperformance in another. Rather than walking away from an underperforming strategy, the strategy is sidelined until market conditions again favor its use, changing the dynamics of working with investment managers. Strategy diversification also changes the investment parameters to allow advisors and investors to benefit from different approaches to the financial markets, different ways of thinking and managing risk, and the evolution of new investment concepts. It takes the concept of diversification to a new level and a new effectiveness.